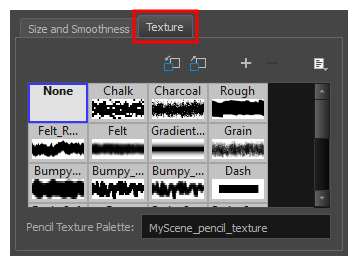 If you have made modifications on the default pencil texture palette in your scene that you wish to undo, you can easily re-import the default pencil texture palette back into your scene as a new pencil texture palette. Click on the Reload Default Texture Palette button. A copy of the default pencil texture palette is added to the scene's pencil texture palette list.